It’s cold, it’s wet, it’s dark, it’s January. But we’re not feeling down, we’re hitting the January blues head on. We’ve teamed up with Devon based home and lifestyle brand Nkuku, supplying them with a living wall and three of our living spheres to adorn their show stand. And what a stand it is going to be. A huge Cot-ten steel glassless greenhouse. With it’s rusty industrial vibe, sparkling green spheres and towering living wall. So the time arrived and last week we travelled to London for the ‘Top Drawer’ trade show in Olympia. We helped set up, prepared ourselves, then stood back and watched the crowds pour in. And we smiled. And we chatted. It was busy. It was our first trade show and we were impressed. It felt positive. Then we travelled to Paris to Maison et Objet and we were blown away! Several aircraft hangers of the most fabulous brands from across Europe. I took as many business cards and promotional postcards as I could carry onto the plane. I returned with not a single one of my business cards but a bulging pocket of other peoples. So we smiled, and we chatted. It was very very busy. It was our second trade show and we were very very impressed. It felt amazing. I hope we will be back in September. People seemed to like our living wall and hanging hydroponic spheres. Now I’m sitting at my laptop emailing possible future clients and hoping one of them might say… Qui. In 2006 we launched a company called The Landscape Architect. 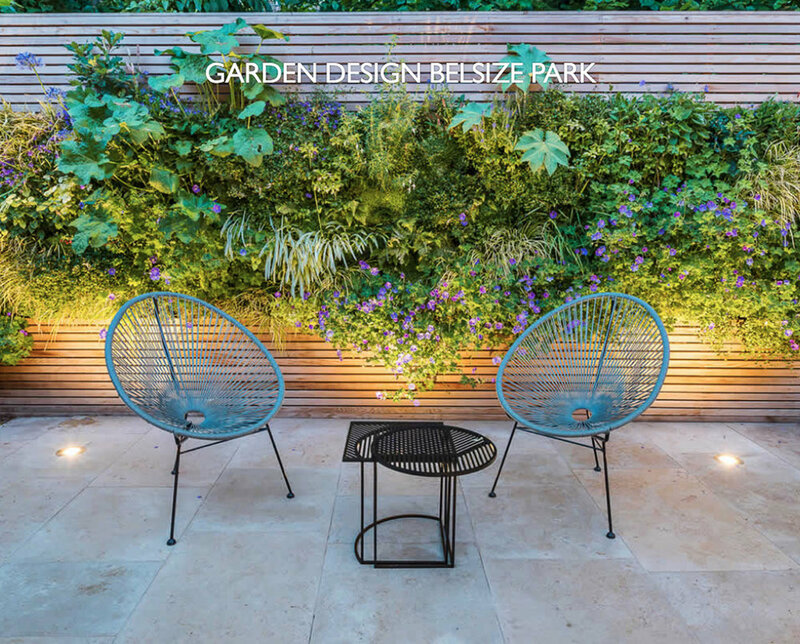 The business was focussed on designing and installing contemporary gardens and landscapes. In 2008 we decided to include a living wall in the scheme for a roof terrace in Hackney. The client loved the concept so we set off to find suppliers. We couldn’t find anybody who offered what we wanted. It was all too dull, too functional, too evergreen, too rectangular, and too rigid. We wanted to track the gable end of a building and create an odd shaped triangular living wall. We wanted lots of colour and drama and seasonality. We wanted something that we could carry up a five floor building which didn’t have any lifts. We wanted something that was light enough to keep the structural engineers off our backs. In the end we decided to create the living wall ourselves. It took months and months of research along with a fair degree of trial and error. It was a sure-fire loss-leader but in the end everyone was delighted with the results. Over the subsequent decade, living walls featured in many of the gardens we designed and installed. With every new installation we were able to refine our system and style. During 2017 we started to appreciate how much we loved creating living walls. It was all that we really wanted to do. In the summer of 2018 we created our first three dimensional living wall with a set of living spheres for a scheme in Devon. As 2018 drew to a close we realised that we had not designed or installed a single garden during the year, let alone a landscape. Everything we had worked on had been a vertical garden. We realised it was time for a new company, with a new name. So welcome to Tapestry Vertical Gardens. What a ridiculous name and a fabulously quirky plant this is. Apparently it’s a rare and much sought-after tropical that I happened to stumbled upon whilst visiting Hardy Exotics, a fantastic nursery in deepest darkest Cornwall. Impatiens niamniamensis, common name Congo cockatoo, parrot impatiens or simply parrot plant, is a species of flowering plant in the family Balsaminaceae. In the DR Congo the leaves of Impatiens niamniamensis are eaten as a vegetable, to produce a vegetable salt and as a cure for heart troubles and illnesses caused by evil spirits. I decided not to eat my cockatoo plant, choosing instead to include it in a scheme for my latest living sphere, where it’s doing very nicely. Having not travelled that far it obviously feels quite at home here in deepest darkest evil spirit free Devon! I think the latest living wall we’ve installed (as part of a new office development in Old Street, London) looks great. Some might say I would say that as I designed them. But I’m not biased, I’m passionate. Be it one of my living walls, a green roof, a community garden or any other type of urban greening, it’s not just about it looking great. Urban greening is important for many reasons. Urban greening refers to public landscaping and urban forestry projects that create mutually beneficial relationships between city dwellers and their environments. The Mayor of London and the London Assembly wants to significantly increase the area of green cover in the built environment. The London Environment Strategy includes policies and proposals that aim to ensure that more than half of London will be green by 2050 and the city’s tree canopy cover increases by 10%. London is a growing city. By 2050 it is expect that up to 3 million more people will live there. A well planned and managed green infrastructure network will be vital to help the city stay healthy and liveable as the population becomes larger. It will also help the city adapt as the climate changes and we experience hotter, dryer summers and more extreme downpours. The Mayor’s new London Plan includes policies that protect the city’s best green spaces and natural areas. However, the pressures on land for the good quality homes, schools, hospitals and places of work which we need, means there will be few opportunities to create more traditional parks and nature reserves as the city grows. London must therefore become greener whilst also becoming denser. To meet this challenge new developments will need to include more green roofs, walls and other urban greening. Existing buildings, streets and public realm will need to become greener too. Green roofs and walls are an essential component of a greener, denser city especially in those areas which have historically had a deficiency in parks and green spaces. They can help store stormwater, provide additional wildlife habitat, or, increasingly, create greener public realm or roof gardens above our busy streets. My hope is that the living walls we are installing right now will contribute to the wellbeing of future tenants for many years to come. My dream is that we get the chance to install many more living walls in cities across the UK. When creating our living walls we use a huge number of plants. Hundreds, turn into thousands quite easily. One supplier that deserves a mention is Jason Kenway. The plants I get from his nursery, Kenway Nurseries are always excellent. The effort that must go into producing such large quantities of plants whilst maintaining such a high standard is impressive. Their plants now account for around 75% of the stock we use in our living walls and I think they look great. In this section of living wall, you can see another fabulous Persicaria (P. microcephaly ‘Purple Fantasy’) fighting it’s way through a mass of soleirolia soleirolii, along with Acorus gramineus ‘Variegates’ and a handful of Viola odorata ‘Königin Charlotte’ and some wonderful (still yet to flower) Dierama pulcherrimum. Working with professionals that really know what they’re doing is always a pleasure. John Davies is an excellent garden designer and The Garden Builders have executed his designs perfectly. We’ve created a number of living walls for John over the last few years and think that this is probably one of our best. Thanks to the excellent planning and an easy working relationship with both John and The Garden Builders this job was delivered on time and without issue. We are delighted with how the wall looks and know for a fact that the client is too! Please follow this link to see lots more images of this fabulous garden. Ideas are all around us. Personally I find they dance around inside my head and drift across my subconscious mind like clouds. Often, like a dream, they fade when I wake, but sometimes they stick and solidify in my minds eye. Then I can feel the idea growing. For years I’ve been pondering how to create a living surface that’s not 2D and flat but 3D, with depth and possibly movement. Time and again it was a ball, globe or sphere like shape I seemed to gravitate towards. Now, I know how to create living walls, but a living sphere, that’s a bit harder. Then one day a few months ago, I literally work up from a dream and bingo... my subconscious mind had worked it out for me. So, over the last few months I’ve been working in my new nursery developing my idea, and this is the result. My living sphere. This is no short term hanging basket for the summer months, this is botanical ball of perennial plants that, just like my living walls will develop and grow over years and last for decades if maintained correctly. Like my hydroponic living walls they will be automatically watered (and so fed) keeping maintenance to a minimum and like my living walls they will hopefully delight, entertain and facinate all those that enjoy the beauty of the botanical world. I’m delighted with the result and I hope some of you out there will like them as much as I do. The spheres will come in several sizes, S, M, L, XL (and possibly an XXL for those with commercial size spaces). Please email us to register your interest in ordering one of our original living spheres.